The California Eye Surgeons is a sub-specialty Eye Care practice serving the South Bay and the Peninsula. We provide full range of surgical eye services for newborn to elderly patients. At California Eye Surgeons, you will receive compassionate and technically-excellent care from physicians trained at the top institutions in the country. Dr. Harrup Kaur, a Mayo Clinic-trained, Board Certified Eye Surgeon, is skilled in advanced Cataract techniques and performs a variety of Premium Cataract surgeries. Dr. Kaur was the first Cataract surgeon in South Bay to be certified in the LenSx Laser Cataract surgery. The LenSx laser is a leap forward in Cataract surgery. The accuracy and precision of the LenSx Laser assists with predictability of the visual outcomes of Cataract surgery. 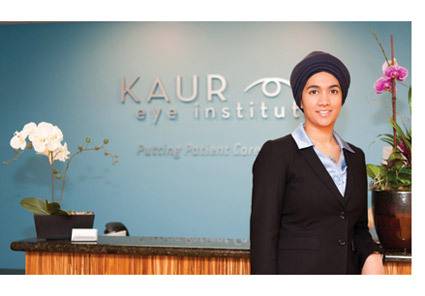 Dr. Kaur is also one of the leading Cataract surgeons in South Bay to perform iStent micro-glaucoma surgery in combination with Cataract surgeries. iStent is the smallest medical device ever approved by the FDA, which in the hand of a skilled Cataract surgeon improves the eye pressure for patients suffering from chronic Glaucoma. Dr. Irene Hsu-Dresden is a Harvard graduate and fellowship trained in Pediatric Ophthalmology. She specializes in the Ophthalmological needs of children starting from newborn to young adults. Dr. Hsu-Dresden is also one of the few surgeons in Northern California specializing in adult strabismus, correcting cross-eyed and misalignment in adults. Dr. Hsu-Dresden is one of the few Board Certified eye doctors in the Bay Area who provides eye services to Special Needs children. She uses the latest technologies and tested examination techniques to accurately assess the state of the visual system in Special Needs children. This is essential to developing an individualized treatment plan to ensure the optimal functioning of the visual system in these children who often cannot verbalize their concerns. M&S Electronic Pediatric Vision Screening System, used by the top eye research institutions in the country, including the NIH, NEI and PEDIG. Zeiss A-scan: to help accurately monitor the progression of myopia in your children during their critical developmental period. Zeiss IOL Master: the Gold Standard in cataract surgery measurements, which helps ensure that after cataract surgery you have the potential to finally be rid of glasses forever. Zeiss Atlas corneal topographer: takes the most accurate measurements to ensure the safest Cataract surgery outcomes. Zeiss Visulas YAG III Laser: a precision laser for secondary Cataract and Glaucoma therapy, which can be done in the office. Lumenis Selective Glaucoma laser: allows a long-term lowering of eye pressure to more safely control your Glaucoma and prevent progressive visual field loss. Zeiss Cirrus Spectral Domain OCT: provides cross-sectional images of the eye to detect potentially blinding diseases which can interfere with the results of your Cataract surgery. Lipiview to digitally analyze the severity of your dry eyes and Lipiflow thermal pulsation system for treatment of Dry Eyes. At the California Eye Surgeons we are dedicated to electronic health records and its use to enhance the safety and quality of your care. The California Eye Surgeons is the first eye clinic to be electronically linked with the El Camino Hospital system. Our doctors can communicate electronically with your doctor the same day as your visit. Upper and Lower Eyelid Surgery can improve vision from sagging eyelids and improve the overall appearance of eyes and face. At the California Eye Surgeons, a Board Certified Eye Surgeon provides comprehensive, total cosmetic eye care including botox and dermal fillers. From the time you contact our office to well past your appointment, we are committed to putting patient care first. We believe that everyone has the right to high quality eye care. We accept all major insurances. However, if you do not have health insurance, we do not believe that the health of your eyes should be compromised. Please contact our office to discuss our very fair and affordable options for those without access to insurance at this time. Accepting New Patients for eye surgery.